Royal Caribbean, a leading global cruise brand, will debut Harmony of the Seas, the world’s largest cruise ship, in May this year. The Oasis Class ship will span 18 guest decks, encompass 227,000 gross registered tonnes, carry 5,497 guests at double occupancy, and feature 2,747 staterooms. The Oasis-class is an architectural marvel touting Royal Caribbean’s exclusive seven neighbourhood concept that includes the Central Park, Boardwalk, the Royal Promenade, the Pool and Sports Zone, Vitality at Sea Spa and Fitness Center, Entertainment Place and Youth Zone. 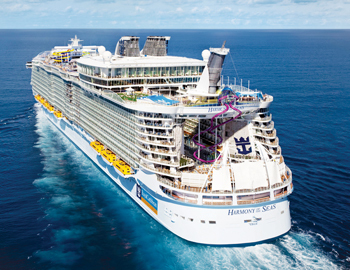 Harmony of the Seas will bring a jolt of adventure for the entire family, with many first-at-sea features, says Mohamed Saeed, general manager Middle East, Royal Caribbean Arabia. Guests setting sail aboard the vessel to Europe’s most popular destinations in the Western Mediterranean will be able to enjoy more family-friendly offerings than ever before, such as Royal Caribbean’s signature DreamWorks Experience, enhanced entertainment in the award-winning Adventure Ocean youth programme, and a new collection of family amenities, the company said. Royal Caribbean has also reimagined and enhanced the unique experiences that have made them the best cruise line overall 12 years in a row. 'There’s no turning back once you take the plunge 10 storeys into the mysteries of the deep on The Ultimate Abyss, the tallest slide at sea. The Perfect Storm trio of multilevel water slides and Splashaway Bay interactive aquapark will keep kids busy. Take a stroll through tree-lined Central Park, or find your own haven in any of the other seven iconic on-board neighbourhoods. Sip a post-dinner cocktail crafted by a robot in the unique Bionic Bar, or sit back and watch for the first time at sea, Broadway’s hit Musical; Grease. You can even share every moment with not just family on-board, but friends back home with Voom, the fastest Internet at sea,' says Saeed. POOL AND SPORTS ZONE: An ample playground for guests of all ages, featuring four unique types of pools, two FlowRider surf simulators, a zip line, and a trio of water slides as well as The Ultimate Abyss. BOARDWALK: This breath-taking neighbourhood was inspired by both the seaside piers that dot the coast of England and the nostalgic boardwalks of yesteryear such as Coney Island. Boardwalk is an area for the entire family to enjoy together. The elements of the Boardwalk are a dynamic way to engage families in a colourful original carousel as well as casual eateries, retail outlets and carnival games. CENTRAL PARK: Royal Caribbean brings the outdoors in with Central Park, a revolutionary design in which the centre of the ship opens to the sky and features lush, tropical grounds spanning more than the length of a football field. Combined with an incredible array of retail, entertainment and eateries as well as quiet nooks for reading and relaxing, Central Park is one of the ship’s most ground-breaking spaces. ROYAL PROMENADE: A natural but significant evolution of the line’s signature Royal Promenade featured on the Voyager- and Freedom-class ships, the design found on Harmony allows guests to have a physical connection with the neighbourhood above – Central Park – as natural light cascades down from the sky. Harmony of the Seas is the first ship to feature the futuristic Bionic Bar, a technology-forward venue complete with two robotic bartenders that shake, muddle and mix a wide variety of drinks made just to order. ENTERTAINMENT PLACE: This district features signature after-dark spaces, delivering a variety of entertainment each night and providing guests the opportunity to customise their evening experiences. YOUTH ZONE: A haven for children and teens, this spacious home to the award-winning Adventure Ocean youth programme features a wealth of kid- and teen-friendly adventures than ever seen on a cruise ship. VITALITY AT SEA SPA AND FITNESS CENTER: The centre encompasses various amenities. Guests can soothe mind, body and soul through the most advanced spa and anti-aging therapies, the latest fitness equipment and healthy dining options. Restaurants on the ship feature celebrity chef partnerships like Jamie’s Italian by Jamie Oliver and Michaels Genuine Pub by Michael Schwartz. 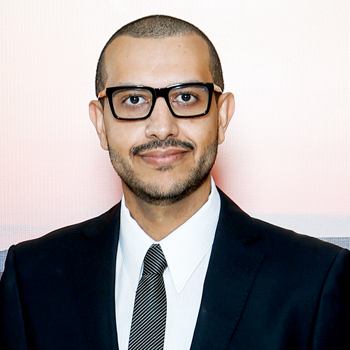 Harmony is a destination by itself, a ship unlike anything else at sea, says Saeed.